THE baroque era in Turkish architecture lasted deep into the 19th century, leaving behind lavish buildings, such as the Lily Mosque in Istanbul and waterside pavilions that seem to float on the Bosphorus. The baroque period in Turkish monetary policy will last until June 1st, when the central bank will simplify its equally ornate monetary-policy framework. It will henceforth rely on a single interest rate (the one-week repo rate), which it will raise to 16.5%. This will supersede a jumble of interest rates (see chart) that has left the Turkish currency perilously close to submersion. Turkish baroque mingled Western and Ottoman styles. The country’s fussy monetary policy also reflects competing influences. Its central bank wants to stabilise the lira and quell inflation, which remains in double digits, far in excess of its 5% inflation target. On the other hand, the president, Recep Tayyip Erdogan, is eager to sustain the economy’s furious pace of growth (7.3% in the last quarter of 2017, compared with a year earlier) and to defy the usurious claims of what he calls the “interest-rate lobby”. According to the well-trained technocrats dotted throughout Turkey’s policymaking apparatus, higher interest rates would help stabilise the economy, curbing excessive spending and luring back the foreign capital on which the country relies to finance its current-account deficit (5.6% of GDP in 2017). According to Mr Erdogan, however, higher interest rates do not curb inflation, but cause it. 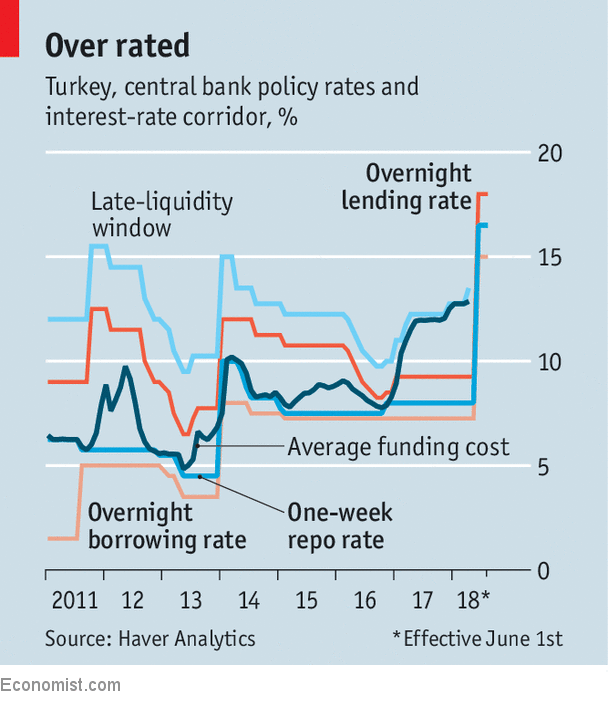 In apparent deference to Mr Erdogan, Turkey’s central bank has long refrained from raising the one-week repo rate, which had served as its monetary mainstay. Instead it increased the cost of borrowing from a more obscure facility, the late-liquidity window, which lends to banks that have run short of money at the end of the day. It also forced banks to turn to this expensive window for a larger share of their funding. In this way, it surreptitiously increased their average cost of borrowing. In recent weeks, however, it became impossible to appease both Mr Erdogan and increasingly demanding bond markets. As American Treasury yields, the dollar and oil prices began to rise, foreign investors began to doubt Turkey’s commitment to keeping its imbalances in check. Any policy move big enough to convince the markets would also be stark enough to antagonise Mr Erdogan. For a frightening week, it looked as if Mr Erdogan’s sensitivities would prevail. But the more he bullied the central bank, the more the markets bullied him. The lira slid by over 12% in the two weeks before May 23rd, when the central bank finally decided to raise interest rates by three percentage points, followed five days later by its decision to simplify policymaking. The new interest rate of 16.5% is almost six percentage points above Turkey’s rate of inflation. Foreign investors will now be asking themselves how long the central bank can persevere with its tightened stance, and whether it will raise rates again if the lira’s weakness or oil’s strength further threatens price stability. Other emerging markets have shown great persistence in the fight against inflation. Russia has kept its interest rates more than three percentage points above inflation for more than two years; Brazil has done so for more than four. By mid-2016, even the IMF called on Russia’s central bank to relent. As a sign of Turkey’s commitment for the long haul, its simplification of monetary policy may be as important as its tightening of it. The reform shows that the central bank is no longer trying to accommodate competing objectives. India sent a similar message when it began clarifying its inflation-fighting goals in 2014 and adopted formal inflation targeting in 2015. Even before Mr Erdogan intruded so clumsily on its independence, the Turkish central bank was known for monetary intricacy. Unlike other central banks, it often let market rates wander quite far from its target. And its overnight deposit and lending rates, which establish a floor and ceiling for interest rates, were often positioned “asymmetrically”, with one further from the target rate than the other. It felt that adding gratuitous uncertainty to interest rates would deter speculative inflows of capital. Its new framework abandons this asymmetry. Turkey has many problems. But the need to deter inflows of capital is no longer one of them.